Perhaps the greatest comeback in sports history and a recent piece in McKinsey Quarterly both support the notion that old-fashion intuition is not out of date. Executives, however, are not concerned only with predicting things they cannot influence. Their primary duty—as the word execution implies—is to get things done. The task of leadership is to mobilize people to achieve a desired end. For that, leaders need to inspire their followers to reach demanding goals, perhaps even to do more than they have done before or believe is possible. The 11 sailors were a collection of international superstars. The engineers who designed the yacht and the programmers who built the software used to plot strategy had no peer. 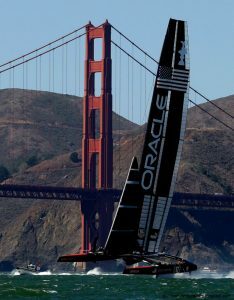 Oracle’s computer simulations suggested the AC72—which cost at least $10 million to build—wasn’t just the better boat in the final, it was the fastest sailboat ever to compete for the Cup, capable of 48 knots, or about 55 mph. Both Oracle and New Zealand had been foiling downwind. [Video explanation of ‘foiling’ here – ed] But New Zealand’s boat was getting partially up on its foils on the upwind leg, too. Oracle had experimented with upwind foiling five weeks before the race … Nearly every time they tried, Oracle’s hulls would fall off the foils and the bows would nose-dive into the water… There was little time to experiment with the new technique, and Mr. Ozanne’s software indicated Oracle would easily outsail New Zealand upwind even without foiling. Sailing upwind involves a trade-off between speed and distance—the tighter the angle to the wind, the shorter the total travel distance but the slower the boat moves. Mr. Ozanne’s computer program had given a target: Sail into the wind at a relatively tight angle of about 42 degrees, which would produce the optimal mix of speed and travel distance. Looking at the video, Mr. Spithill could see that the Kiwis had come to a different conclusion. They were sailing at much wider angles to the wind—about 50 degrees, on average. They were covering more water but reaching higher speeds—more than enough to offset the greater distance traveled. Foiling appeared to be the key. Oracle’s computers hadn’t anticipated such speeds. Mr. Spithill didn’t relish losing the Cup to a team who could say, rightfully, that their win represented a triumph for the craft of sailing. With his team’s prospects getting dimmer by the hour, Mr. Spithill decided it was time to stop obeying the computers and start thinking like sailors. The next morning, a scheduled off day, Oracle’s sailors made upwind foiling the focus of their practice. Rather than sailing 42 degrees off the wind, what the team called their “high and slow” mode. Mr. Slingsby suggested trying 55 degrees, which he called “low and fast.” When the boat got moving fast enough to get up on its foils, the crew made another discovery. It was able to tack more quickly—13 mph rather than 10 mph. So what about that expensive model? Back at the Oracle base, Mr. Ozanne said he had found the flaw in the computer model. To get going fast enough upwind to get on the foils, the yacht initially had to sail at an angle that would force it to cover more water—something the computer wasn’t programmed to allow. When Mr. Ozanne input the wider angles into the software, the computer had recalculated the speed and showed the boat could sail faster that way, confirming what the sailors had found. About 45 minutes before the start, Mr. Spithill heard a loud bang. A critical piece of the sail—a part attaching some of the flaps to the wing—had sheared off. The wing wouldn’t curve properly without it. Two powerboats sped over and the maintenance guys climbed up onto the wing and started shooting hot glue everywhere. They finished the job about five minutes before the boat had to enter the starting area. Mr. Spithill and his tactician looked at each other and laughed. As Oracle approached the finish line, Mr. Spithill glanced at one of his teammates, Kyle Langford, who was working in front of him. Mr. Langford, a 24-year-old last-minute addition to the crew, was in charge of adjusting the angle of the 13-story sail with a thick rope he held in his hands. There was nothing high-tech about this job, but it was absolutely crucial. If Mr. Langford dropped the rope, the yacht would quickly lose momentum and possibly capsize. Proponents of statistical analysis dismissed Joe Morgan as unwilling to accept the truth, but in fact he wasn’t entirely wrong. Models are useful in predicting things we cannot control, but for players—on the field and in the midst of a game—the reality is different. Players don’t predict performance; they have to achieve it. For that purpose, impartial and dispassionate analysis is insufficient.